Home » Health » What Is Erythema Multiform? Erythema Multiforme is a hypersensitivity reaction to the skin which is often triggered by infection, especially viral infections such as the Herpes Simplex Virus ( HSV ). Erythema multiforme is characterized by the appearance of reddish, acute skin lesions and can heal without causing complications. In some cases, Erythema Multiforme does not only occur on the skin, but can also occur in the mucous layer, such as the lips and eyes. Erythema Multiforme that does not occur in the mucous layer is minor Erythema Multiforme. While major Erythema Multiforme occurs in one or more mucosal layers, but does not exceed 10 percent of the total body surface area. At present, Erythema Multiforme is considered different from Stevens-Johnson syndrome or toxic epidermal necrolysis (TEN). Besides being caused by viral infections, such as the Herpes simplex and Epstein-Barr viruses, Erythema Multiforme can also be caused by hypersensitivity to drugs. Erythema Multiforme triggered by drugs is often related to a person's ability to decipher the drugs in the body that are disrupted, resulting in a buildup of substances from the drug in the body. This condition can trigger an immune response, especially in skin epithelial cells that cause Erythema Multiforme. Pubic pain and pain when urinating. Blurred vision and more sensitive to light. Pain in the mouth and throat area, making it difficult to eat and drink. After these preliminary symptoms, skin lesions due to erythema multiforme begin to appear on the patient's skin, both in small amounts to hundreds of lesions. Generally, skin lesions first appear on the back of the hand or instep, then spread to both limbs to reach the body. More lesions appear on the arms than in the legs. It can also appear on the palms and feet, and group on the elbows and knees. Besides the feet and hands, lesions also commonly appear on the face, body and neck. Often the lesions that appear feel itchy and burn. At the initial appearance, the lesion will be round and red or pink. Lesions can grow and protrude (papules), and enlarge to form plaques with a size that can reach several centimeters. The growth of the lesion generally lasts 72 hours with the central part of the plaque or the lesion will darken along with the enlargement of the lesion, and can blister or form fluid (blister), and harden or crust. Other forms of erythema multiform lesions are iris (or target lesions) that are round in shape with visible edges, and often have three concentric colors. The color of the middle part of the iris lesion is generally dark red which can also form a blister and harden. The periphery of the lesion is bright red, and the part between the edge and the middle is pale red and prominent due to fluid (edema). Skin lesions that occur in patients due to erythema multiforme are not limited to just one form, meaning that patients with erythema multiforme can suffer iris lesions or non iris lesions. In addition, lesions that appear in patients can occur at various stages of development of the lesion. Lesions in the mucous layer are characterized by swelling, redness, and blister formation. Blisters in the mucous layer break easily and cause the formation of a wound (ulcer) which is covered with a whitish layer. As a result, patients can have difficulty speaking and swallowing food. Vaccines derived from weakened viruses. Anticonvulsants or anti-seizures, such as phenytoin . Skin biopsy. A skin biopsy can confirm the appearance of multiform erythema in a person. In addition, by performing a skin biopsy, the doctor can eliminate other diseases that have symptoms similar to erythema multiforme, especially Steven-Johnson syndrome and toxic epidermal necrolysis . Blood test. Examination is carried out to identify the presence of antigens and antibodies. These two test methods serve to ascertain the presence of viruses or bacteria that can trigger the appearance of erythema multiforme such as the Herpes simplex virus or Mycoplasma sp . Treatment of erythema multiforme focuses on eliminating the triggers of erythema multiforme and handling the symptoms that arise. Therefore, identification of triggers for erythema multiforme is a very important diagnostic step to provide an effective treatment method. Especially for patients with major erythema multiforme, patients can undergo inpatient care at the hospital. The aim is to prevent and treat complications of erythema multiforme, as well as maintain the patient's body fluid balance. 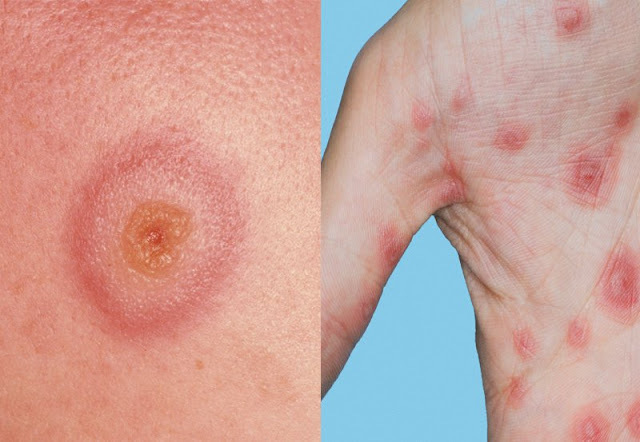 If it is known that the cause of erythema multiforme is a virus, the patient can be given antivirals, such as oral acyclovir or injections, especially those caused by the Herpes virus implex . If the cause of erythema multiforme is bacteria, then the patient can be given antibiotics to treat bacterial infections that trigger erythema multiforme. If the cause of erythema multiforme is certain drugs, patients must immediately stop taking the drug. Topical antihistamines and corticosteroids to treat itching. Mouthwash containing anti-pain and antiseptics to reduce pain and prevent secondary infections in the oral cavity. Oral corticosteroids . This drug can be given in the early stages of treatment of major erythema multiforme. Antimalarial drugs, such as the hydro xychloroquine . Erythema Multiforme generally resolves on its own without leaving a scar with a healing period of about 2-3 weeks. However, for cases of major erythema multiforme, the healing period can last up to 6 weeks. 0 Response to "What Is Erythema Multiform?"